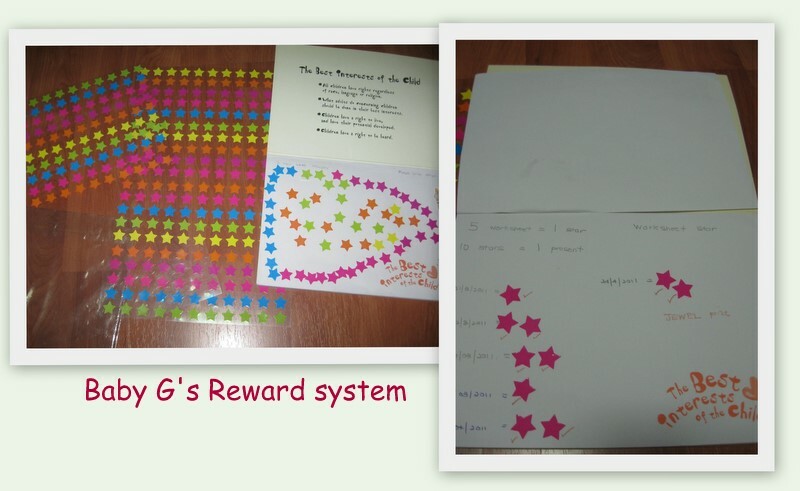 It's always difficult to get Baby G to do his worksheets so we decided to re-use the Reward System that we had when he was being toilet-trained. Basically, it consists of stickers that he gets when he completes his tasks. Previously, when we were toilet-training him, he would be rewarded with a 'Star' sticker whenever he told us he wanted to go to the toilet. After accumulating about 20 'Stars', he would get a small prize. After he was fully toilet-trained, we stopped this Reward System and Baby G did not ask about it. Now I have decided to re-start this system since it's so difficult to motivate him to do his worksheets. Now, for every 5 pages of worksheets, he gets a 'Star' sticker and for every 10 'Star' stickers, he'll get a prize... so that works out to 50 pages of worksheets per prize. So far, he's accumulated 1 prize... which was the figurine from the movie, 'Rio', which we brought him to watch, courtesy of Happy Meal. Looks like we will be eating a few more Happy Meals to collect the figurines.